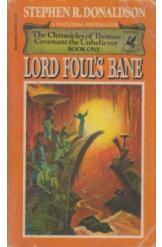 Lord Foul's Bane by Stephen Donaldson, Sci Fi. Book is in good condition, all pages intact. Thomas Covenant becomes known as "the Unbeliever" on account of his skepticism about the magical Land into which he has been drawn. And yet, not only must he learn to accept the reality of this bizarre new world, but he must also learn to use the power of White Gold to protect it from the ancient god of destruction, Lord Foul. Book one of the Thomas Covenant the Unbeliever series.